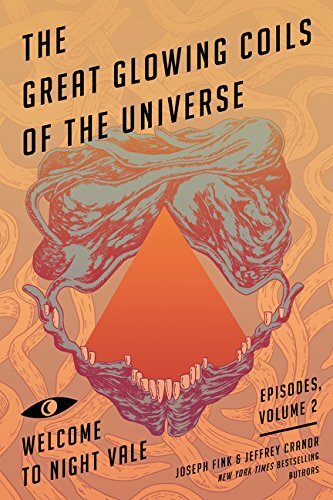 Volume 2 of the Night Vale Episodes collection comes out at the same time as Volume 1. Covering the second year of the podcast, it goes from episode 26 to 49, and the second live show they performed, “The Debate.” These are word for word the episodes as they aired, like in Volume 1, and like Volume 1 include the introductions, the prologues to each episode, the name of the songs played during the Weather section of each show, and the proverbs at the end. Also like Volume 1, it adds the layers of visual appreciation, strange illustration, and behind the scenes discussion to the sound-only experience of the podcast. These are the stories that were airing while the show went from an obscure passion project to one of the biggest podcasts on the charts. What's striking is that even though the story complicates and takes on more ongoing arcs and callbacks, it stays fundamentally the same. This is where this project started changing the lives of the people making it, but the story stays true to itself—and Fink and Cranor, in their alternating introductions, are honest about how strange and surreal sudden niche fame was, as well as their individual processes of writing the episodes. Night Vale, always weird, gets weirder. In these pages, the rivalry with Desert Bluffs goes to new levels. The campaign to find a new mayor, between the Faceless Old Woman Who Secretly Lives in Your Home and the literal five-headed dragon Hiram McDaniels, leads to a deeper look at how the town is run. Intern Dana journeys through what's probably an alternate reality with odd effects in its weird reality. And many of the background and offhand mentions in season one become stories of their own here in season two. This is also where Night Vale finds its feet and starts really exploring what the framework established in season one can do, and it's often creepy, consistently unexpected and bizarre, and always addictively charming—even when plots go sideways. One of the best things about these stories is the feeling that the writers know what they're doing even when the characters have no idea what's going on. There's a consistency and surety to these stories that allows the reader to accept almost anything, because it's well established that almost anything can happen, including plot lines that go nowhere but still impact characters' lives, and storylines that seem inconsequential only to come back later and significantly matter. Volume 2 is another beautifully made book. It's full of illustrations and peeks into how the stories happened. It's a broadening and deepening of the world without losing the charm that it was built on. It's more complicated, more strange, and makes just as much emotional sense as it always did—which, as it turns out, is all a strange story needs. If it feels true, it is. Volume 2 could probably be enjoyed with no knowledge of the podcast and without having read Volume 1, but as most of the character introductions happen in Volume 1, the books should be read in order. On the other hand, reading it out of order might be thematically consistent with the story as a whole, and wouldn't really damage your experience if you don't mind spoilers.